We love our new blinds! The Ford's call ahead telling you when to expect them to arrive at your house, that is nice. The installation went quickly and the blinds look great. We are very happy with "A Blind View" and would recommend them to anyone wanting to deal with nice people who are great at what they do. We have big smiles on our faces. Ron and Shannon Ford are excellent to work with on window treatments. They are knowledgable, helpful, professional, reasonable in price and punctual. Everything we looked for in choosing a firm to deal with on our blinds in our new downtown condo. Barbara and I highly recommend them. Hope your show went well. I just wanted to tell you how very pleased I am with my shutters! They r absolutely perfect! I wanted to thank you again for being able to accommodate our installation request. It couldn't have worked out any better for our situation. We really appreciate all of your help and look forward to making strong referrals to anyone who is considering a window treatment! Hope u have a great weekend. Ron and Shannon: sending a late thank you for the gift cards you delivered to our home! That was a great way to treat your customers and I was totally happy to refer you to our friends. I'm glad that it worked out! We are totally happy with our purchase from you. Thanks again very much!! Hi Ron, I want to thank you again for my wonderful new 2" blinds. They make such a huge difference, especially now that the weather has gotten so hot. They not only help keep the heat out of the house, but they protect my floors from UV rays., They also add a slightly tropical look to the rooms, which makes me think of ocean breezes. I wouldn't hesitate to recommend A Blind View to anyone. Your professionalism and perfectionism is just what I was looking for. I'm looking forward to getting the remaining windows done ASAP! Just wanted to let you know how very pleased I am with the blinds that you installed in my home. Just as you said, the rooms do, indeed, look larger; and to think that I didn't believe you. It is much easier to close down the house at night by just pulling "a few strings." And on top of everything else I am enjoying about having the blinds, I don't have to take them to the dry cleaners. It has been well worth the investment. Thank you again for your timely service and expert installation. Purchased blinds from A Blind View and they look great and everyone that has seen them has commented on how good they look. Very pleased with the job they did, would recommend them if you have a need for blinds. We just had our new Allure Transitional Blinds installed and they are amazing! From beginning to end, the whole experience has been wonderful! He let us take our time deciding what colors worked. He even helped us with an honest response! Ron is an honest and caring businessman and his wife Shannon, who works with him, is just as nice! Ron was punctual and he let us know immediately if there was a delay in getting to our house. He even called to let us know how long they had been driving on his way over! They are very clean while working. Ron also took the time to make sure we knew how to open and close our new blinds. You can't go wrong in calling A Blind View! Ron was very knowledgable about all his products and great with helping me decide between designs. Went with 1 set of shutters...love them and woven cordless shades which I also really like. Ordered and he installed ASAP. Very happy with our order. Will be ordering again soon. I can't say enough good about A Blind View. We had some difficulties with the manufacturer of my blinds but Ron and Shannon were absolutely fantastic to take care of us. Ron made multiple trips up to my house to make sure the blinds were correct. We absolutely love the blinds. Ron was good to help us pick the best product for all of our windows. With them facing the west, the sun can be quite hot and they have helped with the heat of summer. I will definitely be recommending them to friends who are building new houses or in need of shades. As part of a recent renovation project, I enlisted the help of A Blind View to provide window treatment solutions for six windows that have always been a decorating challenge because of their size and location. Ron did a great job in presenting a number of appealing options with a myriad of color choices. Delivery time and installation were very prompt and efficient. I am very happy with the finished products, particularly the remote control option that is so convenient to use. I would definitely recommend A Blind View for your window treatment needs. up with blinds that complimented my house. Thank you. We are remodeling our house and needed new blinds for our picture window in the living room. The window is too small for one set of blinds and too big for two sets. We checked at Lowe's, Home Depot and JCPenney's. No one carried the size that we needed except for Penney's and then, they were gonna have to be specially made to fit the window. Needless to say, this was over a $1000.00 for just one blind. 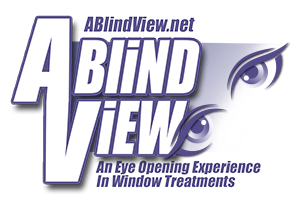 I contacted A Blind View; Ron was very helpful in helping us find the right size at an affordable price. The blinds look GREAT and are even greater at keeping out the hot evening sun. I would definitely recommend A Blind View to anyone wanting or needing new blinds. They are awesome!! My husband and I met Ron at a home show and he stood out above all the rest! He was quick to assess our needs and very prompt to do an in home visit. He made us feel at ease and has excellent customer service skills! Along with his wife, Shannon, who would make calls to schedule our installments and his work assistant, Mark, they made a top notch team!! I love my new fresh clean look and hope to enjoy it for years to come! THANKS To " A BLIND VIEW" for doing an incredible job!!! I would highly recommend this company!